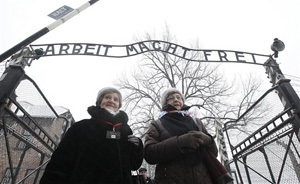 Auschwitz survivors lay a wreath at the former Nazi death camp Wall of Death in Oswiecim, Poland, on Monday, Jan. 27, 2014, to mark 69 years since the Soviet Red Army liberated the camp. Israeli lawmakers and government officials are to attend anniversary observances later in the day. The Nazis killed some 1.5 million people, mostly Jews at the camp during World War II. Photo Credit: The Associated Press, Czarek Sokolowski. A European Jewish leader condemned anti-Semitism as a crime on Monday as Auschwitz survivors and Israeli officials marked 69 years since the liberation of the Nazi death camp. The ceremony at the Auschwitz-Birkenau memorial took place on International Holocaust Remembrance Day, established by the United Nations in memory of some 6 million Holocaust victims, and some 1.5 million victims of Auschwitz, who were mostly Jews. Some 20 survivors walked through the gate that bares the infamous "Arbeit Macht Frei" (Work Makes You Free) sign and laid a wreath at the former camp's Executions Wall, where the inmates, mainly Polish resistance members, were shot to death. Around 60 members of the Knesset, or half of the Israeli legislature, joined the survivors for the observances that included visits to the red brick Auschwitz barracks which house a collection of the victims' belongings and hair, and a list of the names of some 4.2 million Jews who perished in the Holocaust. In a special ceremony in Birkenau, also called Auschwitz II, they also heard from one of the survivors, Noah Klieger, about the Death March when some 15,000 died after Nazis fleeing the advancing Soviet army in January 1945 forced inmates still able to walk to march west in freezing weather. They remembered Jan. 27, 1945, when the Red Army entered the camp and freed the remaining inmates, mostly children and sick people. Israeli coalition leader, Yariv Levin, speaking on behalf of Knesset lawmakers, said that people in Israel should rely on themselves and aim to build a safe world. "Walking here, on this soil soaked with blood of our brothers and sisters, we must assure our children and future generations that a different world, full of hope and free of fear can be built." Speaking at the European parliament ceremony in Brussels, European Jewish Congress President, Moshe Kantor, rejected free speech arguments over what he called the worldwide spread of anti-Semitism. Anti-Semitism is "not an opinion – it's a crime," he said. Kantor pointed to the "quenelle," a gesture invented by the French comedian Dieudonne that some have called an inverted Nazi salute. The comic, who has been convicted more than half a dozen times for inciting racial hatred or anti-Semitism, says it is merely an anti-establishment symbol. The gesture made headlines when soccer star Nicolas Anelka used it to celebrate a goal. "Today we are witnessing the absolute democratization of anti-Semitism," Kantor said. It is "a symbol invented by a so-called comedian that allows young people out for a drink, soldiers having a laugh and even a footballer scoring a goal, to have their own unique opportunity for Jew hatred." In Italy, meanwhile, President Giorgio Napolitano condemned as a "miserable provocation" threats against Rome's Jewish community in recent days, including the delivery of packages containing pig heads to Rome's main synagogue. Napolitano said Monday during Holocaust Memorial Day commemorations that recent insults made against the Jewish community are "comparable only to the repugnant material in those packages." Italian police also detained two men, ages 33 and 47, on suspicion of instigating racial hatred for anti-Semitic graffiti, including denial of the Holocaust, near the main judicial offices in Rome. Authorities say the men belong to different far-right groups. No arrests have been announced for the delivery of the pig head's. Also Monday, the Holocaust Survivors' Foundation USA called on Germany's Allianz to pay aging survivors benefits that their families bought before they died in the Holocaust. "It is shameful that today, Holocaust survivors are not allowed to even bring a lawsuit in a U.S. court to recover these unpaid policies," they said. Legislation that would allow survivors in the U.S. to sue European insurance companies has lingered in Congress for years. even though i support anti-semitism being illegal, i hate that it has to be considered a crime because people should know that racsim agiant the Jewish people is not something that should occur. It's also very upsetting that people deny the Holocaust and claim that it never happened, i can't imagine how hard that is for the Holocaust victims and their families. Antisemitism should be illegal. But if it needs to be a crime to stop people from being racist then that's what needs to happen. It is sad that people don't know that racism shouldn't occur and it is sad that it has to be a crime for people to take it seriously but if it stops antisemitism then it's a good thing for it to be a crime. The Holocaust did happen and it is very sad that people don't think that it did. So many people were affected by it and they fought hard to stay alive. Holocaust victims are so strong and it must be hard for them to hear that people claim it never happened. I think Holocaust victims and their families are very strong. It's great that anti antisemitism is a crime, it's a stepping stone on moving forward in the world for peace and equality. Although I do agree it's absolutely ridiculous that it has to be a law but it is a way to stamp it on society for prevention.